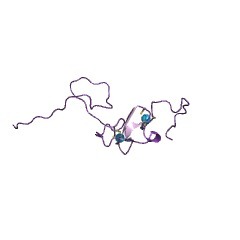 Zinc finger at the C-terminus of An1, a ubiquitin-like protein in Xenopus laevis. 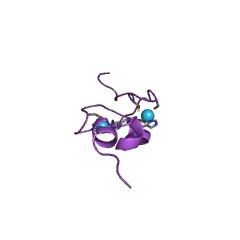 This entry represents the AN1-type zinc finger domain, which has a dimetal (zinc)-bound alpha/beta fold. 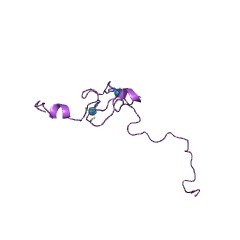 This domain was first identified as a zinc finger at the C terminus of AN1 Q91889, a ubiquitin-like protein in Xenopus laevis [(PUBMED:8390387)]. The AN1-type zinc finger contains six conserved cysteines and two histidines that could potentially coordinate 2 zinc atoms. Ascidian posterior end mark 6 (pem-6) protein [(PUBMED:9441682)]. 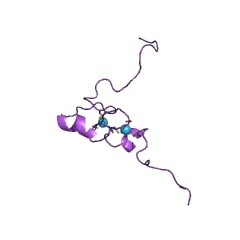 Human AWP1 protein (associated with PRK1), which is expressed during early embryogenesis [(PUBMED:11054541)]. 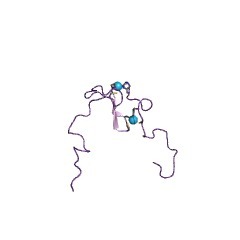 Human immunoglobulin mu binding protein 2 (SMUBP-2), mutations in which cause muscular atrophy with respiratory distress type 1 [(PUBMED:12547203)]. There are 7860 ZnF_AN1 domains in 5998 proteins in SMART's nrdb database. Taxonomic distribution of proteins containing ZnF_AN1 domain. This tree includes only several representative species. The complete taxonomic breakdown of all proteins with ZnF_AN1 domain is also avaliable. Click on the protein counts, or double click on taxonomic names to display all proteins containing ZnF_AN1 domain in the selected taxonomic class. Two related localized mRNAs from Xenopus laevis encode ubiquitin-like fusion proteins. The uneven distribution of maternal mRNAs in unfertilized eggs and the unequal inheritance of these molecules by dividing blastomeres may be one mechanism for determining cell fate during embryogenesis. Complementary DNA (cDNA) clones corresponding to maternal mRNAs localized to specific regions of the Xenopus laevis egg have been previously identified and cloned [Rebagliati et al., Cell 42(1985) 769-777]. The maternal mRNA, An1, was originally identified as being localized to the animal hemisphere of X. laevis eggs and early embryos. 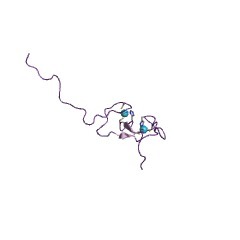 We describe here the two proteins encoded by two An1 mRNA isoforms which we designate An1a and An1b. 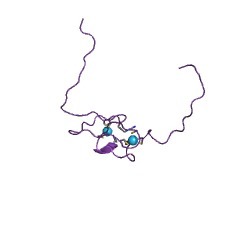 These mRNAs are both approximately 3.0 kb long and are concentrated in the animal hemisphere of unfertilized eggs. The predicted amino acid (aa) sequences encoded by An1a and An1b correspond to 76.9 and 78.6 kDa, respectively, and are 88% identical. Both proteins contain a single N-terminal ubiquitin (Ub)-like domain (50% identical to X. laevis Ub) and a putative Zn(2+)-binding region near the C terminus. Unlike Ub polyproteins and most Ub fusion proteins, the N-terminal Ub-like domain found in the An1 proteins does not undergo proteolytic processing. In contrast to earlier studies showing that the An1 mRNA represents a strictly maternal transcript, we report that both related An1 transcripts are found in later embryonic stages and in all adult tissues tested.